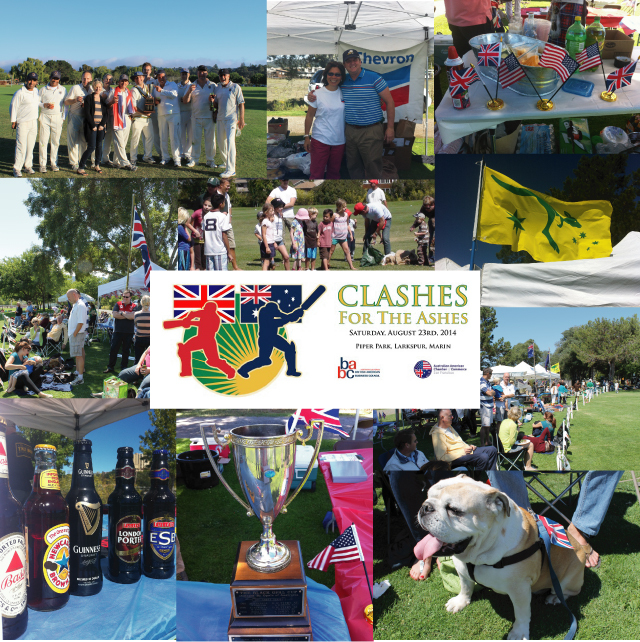 Australian American Chamber of Commerce SF - Clashes for the Ashes..
Mark your calendars and plan to join the AACC and BABC in collaboration with the Marin Cricket Club at the annual Clashes for the Ashes Cricket Match. Watch some exciting cricket, enjoy an Aussie-Style BBQ lunch, Aussie beer and wine and fine British beverages. This is a great day out for all the family with games for the kids at half time and a bouncy castle! - set up your chairs and enjoy the sun in Larkspur. We will also have several great raffle prizes! Hosted by the AACC, BABC and the Australian and British Consulate-Generals. Every year hundreds of spectators from around the Bay Area turn up to watch a veritable feast of cricketing drama. A game of intense competition and usually an excruciatingly close finish is guaranteed. This one day game is played with perhaps as much ardor and passion as the 'real' Ashes series between the test teams and this year, the Aussies will be throwing down the gauntlet to win back the trophy from the British, 2014 champions, with gusto. There's no better way to spend a summer's day than reclining behind the boundary rope in front of a backdrop of beautiful Mount Tamalpais and pretty marquees with their fluttering flags. Enjoy strawberries and cream and Pimms and Aussie BBQ fayre washed down by the best of British and Australian beers. Bring friends and family, including the smallest children who will especially love the special kids' games staged at the lunch break.